It is time for you to upgrade to a new cargo van, and you deserve on that is set up with capability features to make your life easier. The Ram ProMaster is a great choice and a popular pick among people like you who are searching for a new cargo van to purchase. Are you looking to not only fill your van with tools but also have power in the van to pull a trailer full of other things that you need to have with you? The Ram ProMaster has great towing power and can pull a load of up to 2,313 kg. Driving a cargo van may seem difficult, and it can be at times. 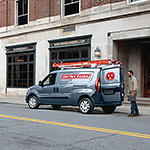 The Ram ProMaster is designed to make that a little easier for you. This vehicle has a best-in-class 11.1 m turning diameter to make it easy for you to maneuver the vehicle in tight spaces.